THE two young men in the bus from Antakya, in south-eastern Turkey, to Reyhanli, nearer the border with Syria, sported long beards, calf-length trousers and toted small drawstring bags with their minimal belongings. They spoke in broken Arabic to the bus driver (local Turks usually have a smattering of the language) but to each other in a regional British accent. They were just two out of hundreds of Muslims from Europe, setting off to Syria to join the battle. That was two years ago. Since then, several thousand may have signed up—and the rate may be increasing. What do they do when they get there? And what might they do when they go home? The effect of the swelling influx is apparent as the Islamic State (IS), a brutal extremist group in Syria and Iraq that has attracted most foreign fighters, stakes a claim to a swathe of territory that is the size of Jordan and embraces a similar population—6m or so. Boastful combatants post well-scripted videos to attract their foreign peers, promising heaven for those who leave their lives of Western decadence to become “martyrs”. They tweet “selfies” holding the severed heads of their enemies after photos of the luxuries, such as Red Bull, an energy drink, that are available to the fighters. And they issue threats to the West while using emoticons—smiling faces, for instance, formed by punctuation marks—and internet acronyms such as LOL. IS has consolidated its hold on Raqqa, a town in eastern Syria that it snatched from other rebels who had themselves taken it over in March last year. Raqqa has become the headquarters for jihadists in Syria and Iraq. Fighters from as far afield as Afghanistan and Sweden have brought their wives and children to the town and moved into the houses of residents who have fled. “Milk”, says a European fighter in northern Syria when asked what he misses about home. “Here you have to get it straight from the cow”. Harder than buying it at Tesco. But junk food is in ample supply, tweets a Swedish fighter, more happily. And there is a lot of time, sometimes days on end, for “chilling”, says the European fighter on Kik, a smartphone messaging app. That is when he makes “a normal-life day: washing clothes, cleaning the house, training, buying stuff”. Thanks to satellite internet connections, the continuing flow of goods into the country and the relatively decent level of development compared with elsewhere in the region, Syria is a long way from the hardship of Afghanistan’s mountains. Last year, to attract others to come, jihadists tweeted pictures with the hashtag “FiveStarJihad”. Yet Western fighters do not shy away from battle. Some have taken part in slaughtering those labelled kuffar (unbelievers), including Sunnis deemed too moderate as well as Shia Muslims, who are all deemed apostates. They help fight for dams, military bases and oilfields. They carry out suicide missions such as the bombing in Aleppo, Syria’s second city, perpetrated in February by Abdul Waheed Majid, a Briton. Westerners are useful for other reasons, too. Hostages released from IS’s clutches say they were guarded by three English-speakers. Foreign jihadists can e-mail the families of hostages in their own language to ask for ransoms. Western fighters often seem to jump at the chance to take part in a fight or help build a new Islamic state. 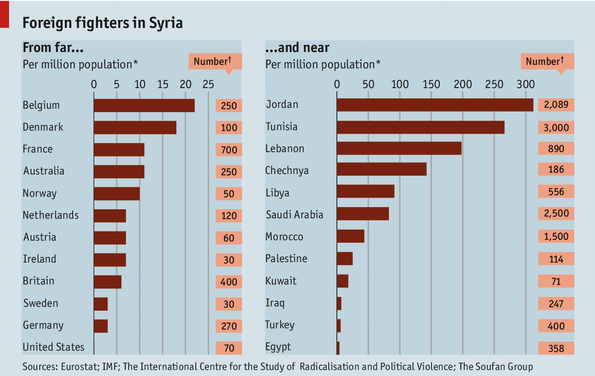 The Soufan Group, a New York-based intelligence outfit, reckons that by the end of May as many as 12,000 fighters from 81 nations had joined the fray, among them some 3,000 from the West (see chart). The number today is likely to be a lot higher. Since IS declared a caliphate on June 29th, recruitment has surged. Syria has drawn in fighters faster than in any past conflict, including the Afghan war in the 1980s or Iraq after the Americans invaded in 2003. While the overwhelming majority of foreign fighters in Syria are Arabs, Britons make up one of the biggest groups of Western fighters. But Belgians, Danes and others have a higher rate per person (see left-hand chart above). France, which has tighter laws against extremism, has also seen more of its citizens go off to wage jihad. One reason for Britons’ prominence is that English is so widely understood, especially in the countries whose governments IS hopes to influence. The video depicting Mr Foley’s murder was titled “A message to America”. IS has published two issues of Dabiq, a glossy new magazine in English, named after an area of northern Syria. Most Western fighters are men under 40, but this war has attracted more women than past causes. 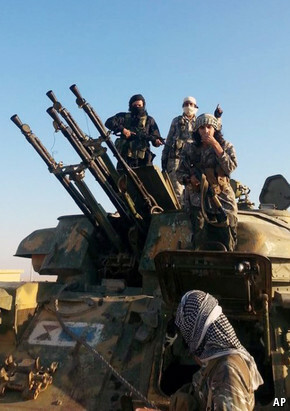 Some 10-15% of those travelling to Syria from some Western countries are female, reckons Peter Neumann of the International Centre for the Study of Radicalisation (ICSR), a London-based think-tank. As many as 30 may have gone from Sweden alone. Some hope to marry, others join all-female units to ensure that women in areas under IS control obey the strictest version of Islamic rules, such as covering up; a few take part in battles. IS is not the only group Westerners join, but it is the most appealing thanks to its global outlook, which includes spreading the caliphate across the world, to its attempts to implement immediate sharia law—and to the glow of its military success. In a five-part documentary filmed in Raqqa by Vice, a news website, as a guest of IS, the group’s religious police are shown educating Syrians, running courts, indoctrinating children and putting on public entertainment. The motives of those going to fight are as varied as their passports. In the early days of the war in Syria, foreigners wanted to help their fellow Muslims, by bringing them food and medicine, or by fighting alongside them. Governments throughout the West were saying that President Bashar Assad and his atrocities must be stopped. Doctors such as Abbas Khan, a Briton, travelled to rebel-held Aleppo—only to be killed in Syrian custody after being captured by Mr Assad’s forces. Since then the fight has become bloodier and more sectarian. Civilians have died in the tens of thousands—the UN says at least 190,000 Syrians have been killed—and rebel crimes have become more frequent. As a result the war is drawing in more extreme types. Those who talked of defending Syrians now deny that the land belongs to the locals, says Shiraz Maher of ICSR. “Bilad al-Sham”, or Greater Syria, has a special status in Islam because it appears in end-of-time prophecies. It belongs to Allah, fighters declare. But what if Syrians do not want Islamic law? “It’s not up to them, because it’s for Islam to implement Islamic rule,” says the European fighter who says he left his home country because it was not Islamic enough. He says he wants to “educate rather than behead Syrians”. IS is the most extreme manifestation of a Muslim response to the history of the past few centuries when the West has been seen to thrive as the Muslim world has declined. One line of thinking blames this on the absence of a caliphate—the last one was abolished by Mustafa Kemal Ataturk, Turkey’s secular moderniser, in 1924—and of sharia rule. Most of IS’s ideas and all of its gorier methods are rejected by most Muslims, who see the group simply as criminal. But it does draw on Islamic theology, arguing—for instance—that non-Muslims should pay jizya, a special tax. Poverty does not explain the lure of jihad for Western fighters. Many of them are quite middle-class. Nasser Muthana, a 20-year-old Welshman who goes by the name Abu Muthana al-Yemeni in IS videos, had offers to study medicine from four universities. Nor does a failure to integrate into the societies around them. Photographs of Muhammad Hamidur Rahman, another British fighter thought to have recently been killed, show a young man in a snazzy suit with a slick hairstyle. He worked at Primark, a cheap retailer, in Portsmouth, a city on the English coast. His father ran a curry restaurant. Nor does religious piety. Before leaving for Syria, Yusuf Sarwar and Mohammed Ahmed, two young men from Birmingham who pleaded guilty to terrorism offences in July, ordered copies of “Islam for Dummies” and “The Koran for Dummies” from Amazon. Some fighters are religious novices, says Mr Maher. More plausible explanations are the desire to escape the ennui of home and to find an identity. “Some individuals are drawn out there because there is not a lot going on in their own lives,” says Raffaello Pantucci, an analyst at the Royal United Services Institute, a London think-tank. Images of combatants playing snooker, eating sweets and splashing in swimming pools have sometimes suggested that jihad was not unlike a student holiday, without the booze. For young men working in dead-end jobs in drab towns, the brotherhood, glory and guns seem thrilling. Many of Belgium’s fighters come from the dullest of cities, where radicals have concentrated their efforts to get recruits. Jihadist networks and radicals no longer need to base themselves in mosques. Some, such as the one in London’s Finsbury Park, where Abu Hamza shook his hook-hands and praised Osama bin Laden, is now under new management. Others are now more careful about whom they welcome. Small groups can meet instead in garages and flats, where their activities are harder to detect. Jihad-minded Europeans can find all the rabble-rousing they desire online. Thanks to Facebook and Twitter they do not even need to bother with password-protected specialist forums. 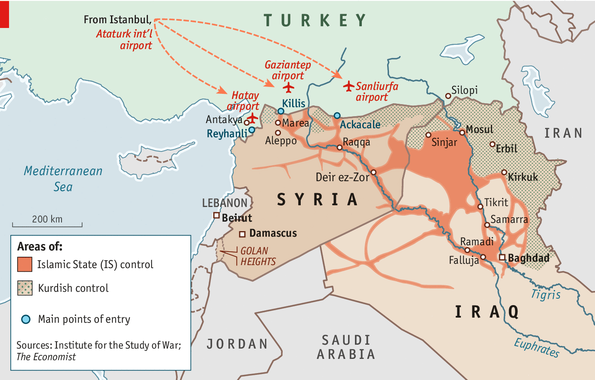 Getting to Syria has generally been easy, though Turkey has tightened its border. Some volunteers arrive without connections. All a fighter needs is a one-way ticket to Istanbul. From there, most take domestic flights to one of the border towns along Turkey’s frontier with Syria that runs for 822km (511 miles): locals dub these internal flights the “jihadiexpress”. Newcomers stay in safe houses before being smuggled across or passing through Turkish passport control using fake Syrian ID cards. Most British fighters have never held a gun, but get trained in camps once inside Syria. Many say they feel more comfortable in a country where the way of life is Islamic—even if not yet Islamic enough—and have no plans to leave or carry out attacks elsewhere. “I am much happier here—got peace of mind,” says the European fighter. But others who have gone to Syria to battle against Mr Assad have become disillusioned, says Mr Neumann. They worry about infighting and about killing other Muslims. “This is not what we came for,” they tell him. Ed Husain, a prominent British former radical, says that witnessing a murder close up (though not in Syria or Iraq) was what started him on the path to reform. One way to encourage that—and to blunt IS’s recruitment—is to tarnish its reputation for battlefield successes. Coming back home is far from simple. Western authorities have some idea of who has gone and notice them when they return. One fighter told Mr Neumann he would be happy to go through a de-radicalisation programme and have the security services trail him, if only he could return to Britain and avoid a long stretch in prison. Assuming that all those visiting war areas without notifying the authorities have done so for a terrorist purpose and should be punished, as Boris Johnson, London’s mayor, suggested on August 24th, is “a very dumb response,” says Mr Neumann. Yet the jihadists’ return is just what Western governments fear. So far foreigners such as Douglas McCain, who recently became the first American known to have died fighting for IS, seem to have focused on fighting in Syria and Iraq rather than at home. More likely are lone-wolf attacks, such as the murder last year of Lee Rigby, a British soldier, by two jihadists in London. Mehdi Nemmouche, a French-Algerian who was arrested on suspicion of having shot and killed four people at the Jewish Museum in Brussels earlier this year, is believed to have spent a year fighting in Syria. Such attacks are much harder for security services to predict and stop. So far the responses of Western governments to their citizens’ self-deployment have varied. America has cracked down on anyone it suspects of going to fight. It can afford to do so, argues Mr Hegghammer, because its Muslim population is smaller than that of many European countries, as is the fear of a political backlash. European governments have been more cautious. Their citizens have travelled out with ease. Harsher penalties might deter some. But prosecute too widely and governments may end up boosting the flow of recruits. And prisons have proved fertile recruitment grounds for Muslim radicals. Deradicalisation programmes, such as those run by Saudi Arabia and Sweden, have mixed results. Most successful, in Britain at least, have been attempts by the so-called Channel programme, part of the British government’s counter-terrorism strategy, to divert young people from extremism. Such efforts, with police, social services and local authorities working together, draw on methods used to help young people leave gangs. And not all of those returning will have blood on their hands. Governments need to offer a way out for those who realise they have made a mistake, says Mr Neumann. Western countries may even benefit from a softer approach. Chastened returning fighters may be the very people to persuade more young men to forgo the fight. But no one yet knows whether today’s European jihadists fighting for IS will become tomorrow’s murderers on the streets of London, Paris or New York. Posted on 30th August 2014 by newsafrica. This entry was posted in Arab Spring, Dictatorship, Iraq, Syria, Terrorism and tagged Bashar al-Assad, Britain, Briton, Iraq, Islamic State, James Foley, London, Syria. Bookmark the permalink.